The infection preventionist’s involvement in construction and renovation projects goes far beyond daily rounding. It is crucial that IPs be involved prior to construction during the concept and planning phases, as well as after construction has completed, and prior to occupancy. It takes a multi-disciplinary team to ensure that construction and renovation projects will serve both form and function of the completed needs of the space. The IP brings an infection-related mitigation skill set that serves throughout the continuum of this process. Facilitation of proper practices: Do the plans allow for proper flow of work processes that facilitate proper infection control measures? The IP should ensure that proper handwashing stations are available. The IP should also be familiar with regulatory agencies' requirements for these types of elements, as well as a basic understanding of architectural code requirements for the space. Soiled utility rooms should be placed in areas that decrease the risk of the spread of infection to those areas located around them. Housekeeping closets should be placed to easily service the area’s needs. An assessment should be performed for the number of isolation rooms that will be required in the area. Form and function: The IP should be consulted when room furnishings are chosen. The IP should assist in choosing items that are not purely aesthetic, but are cleanable and washable surfaces. Flooring should be made of a consistency that is easy to clean. A member of the institution's environmental services department should also be consulted as part of the planning team. Materials and furnishings should be selected that can be cleaned and maintained by the products the facility will be using for day to day cleaning. ICRA and educational needs: A pre-construction infection control risk assessment (ICRA) should be created. The ICRA will serve to identify potential risks and the preventive measures to be taken during the construction activities to reduce them. The ICRA should be reviewed prior to construction with contractors and posted throughout the duration of the project to be viewed by contractors and laborers in the facility’s area of construction/renovation. The IP should also assess the contractor’s familiarity with working in a healthcare environment. 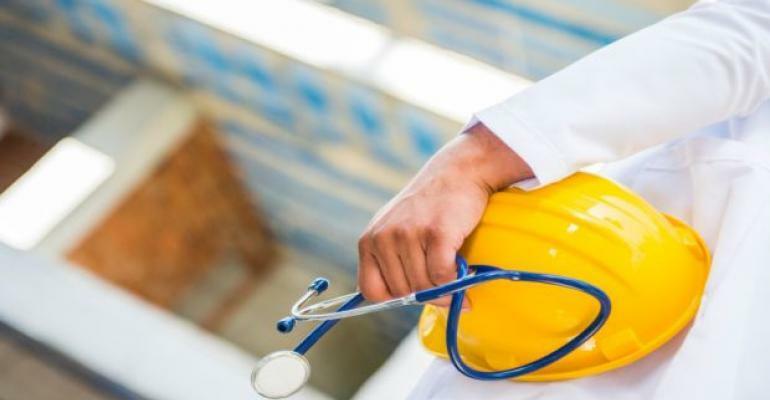 If contractors have little or no experience in healthcare facilities, education regarding basic infection control measures may need to be provided prior to the start of construction date. Barriers: Barriers should be placed re-routing traffic around the construction area. Temporary barriers should be placed to enclose the construction work area off from occupied areas. The barriers should be fire rated, sealed, and airtight. Contractors should ensure that negative air flow ventilation is present in the construction work area. Air filtering: The IP should determine if the work area is using return or outside air filtration. Filters may need to be added and vents should be sealed off with plastic. Noise/Vibration: The IP should realize that loud noise and vibration may cause the dust in air duct systems to be dislodged and become an environmental contaminant. Daily rounds should also include those areas that share the duct system to ensure they are not being affected by loud or vibratory construction activities. Ventilation: It is imperative that air from the construction area not be circulated into the shared facility duct system. Negative pressure air ventilation may be required to isolate the exhaust of the air from the site of construction. Debris Removal: Construction debris should be taken out daily. Contractors should try to take trash out during low activity timeframes and use pathways that are the least traveled. Carts should be covered during transport and wiped down on a daily basis. Environmental Sampling: Environmental sampling is not indicated for use on a routine basis. If proper ventilation and air filtering measures are taken, sampling may not be useful. The facility should decide if and when to use environmental sampling methods. Daily infection control rounding should be performed of the entire area that is under construction. The infection preventionist should maintain a daily log and record of surveillance activities. Any deviation or change recommendation should be addressed when noted. The IP should also take the time to survey the adjacent areas to the construction/renovation site to make sure they remain unaffected during the construction process. When the construction process is finished (but before occupancy) there are a few remaining loose ends for the IP to tie up. Once the construction work is done the area must still be cleaned and readied for occupancy. The IP should work with the contracting crew, the environmental services department, and the facilities management department to facilitate these last processes. Contractor cleanup: The IP must ensure that contractors clean up dust, debris, tools, and equipment left over from the job. Barrier walls must come down and the area should be cleaned and disinfected. Water System: Water lines should be flushed to expel any debris or sediment encountered during the construction processes. HVAC Test and Balance: The HVAC system should have a test and balance performed prior to occupancy to verify readiness. Vents and ductwork should also be cleaned at this time. Facility Terminal Clean: Environmental services professionals should perform a terminal deep-clean prior to opening the area back up again. The IP must sign off on the unit and remove the ICRA prior to the area being opened back up for services again. As you can see, it is crucial for Infection Prevention and Control to be involved in the construction process from concept to completion. IP involvement reduces risk of disease transmission to staff and patients. Detailed recommendations for infection prevention and control can be found in the APIC Text of Infection Control and Epidemiology.